Come Join Us For Our Next Wellness Class! Topic: “Summertime Burns, Bites, Bumps & Bruises”. 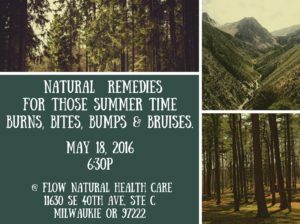 Come learn about how these common summertime ailments can be treated and alleviated with natural remedies! When: Wednesday, May 18th from 6:30 – 7:15 pm.